News & MediaHome News Meet the new BFIRST Fellows! September was a busy month for BFIRST. 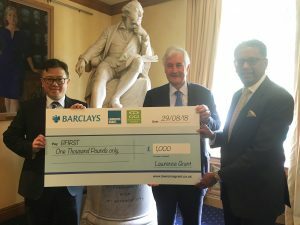 The end of August saw our bi-annual committee meeting where we were awarded a generous donation of £1,000 in the form of a (big fancy) cheque from Lawrence Grant accountants. 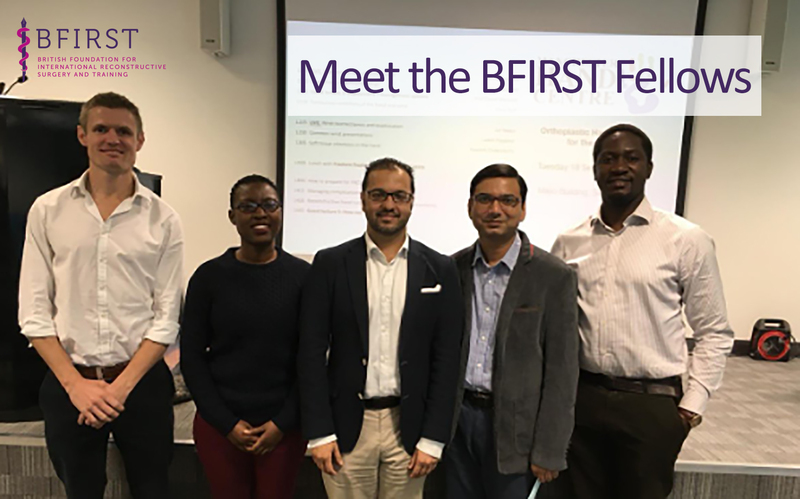 We then welcomed 3 new fellows to various clinics across the UK to undertake the BFIRST fellowship. Their time spent here will enable them to gain knowledge and experience in some of the country’s most advanced surgical units which they will then share with surgeons in their native countries, improving standards of care in some of the world’s poorest nations. Find out more about them below. Linda Katusabe has undertaken the BFIRST fellowship in Hand Surgery at the Royal Devon & Exeter Trust. Dr Gallwango of Comprehensive Rehabilitations Services in Uganda (CoRSU) described her as ‘a diligent student with good academic performance’ recommending her highly for the course. 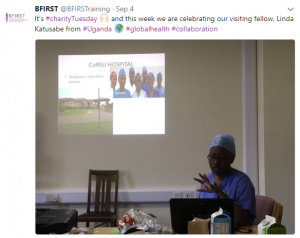 Originally from Uganda, Linda highlighted in her application to BFIRST, just how critical the need for more plastic surgeons in this part of the world has become – ‘The unmet need for hand, plastic and reconstructive surgery in Uganda cannot be overstated’. There are 8 plastic surgeons serving a population of 41 million in only 3 hospitals. Only a handful of these plastic surgeons are comfortable with hand surgery and in most cases the hospitals rely on visiting surgeons from the UK and other developed countries to perform the surgeries. Linda hopes the fellowship will provide her with a great opportunity to gain knowledge and skills in hand surgery and other fields of plastic surgery to help improve the healthcare she can provide, as well as improving training for the upcoming plastic surgeons in Uganda. 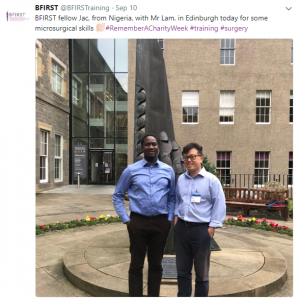 Currently completing his fellowship at St Andrew’s Centre for Plastic Surgery at Broomfield Hospital, Jac-Okereke views his time working in the UK as a ‘rare opportunity to gain exposure to the standards of practice of plastic surgery in a well-established centre’. In his recommendation of Jac-Okereke to St Andrews, resident Plastic, Reconstructive and Hand Surgeon, Fortune Iwuagwu described him as ‘keen, well-motivated, conscientious and reliable’. Jac hopes to acquire the necessary skills to further develop his level of practice in order to deliver improved levels of patient care and expertise when he returns to his native Nigeria. As burn care is a specific area with need for improvement in this country, he hopes the programme at St Andrews, a leading UK specialist burns clinic, will prove invaluable to the future of the newly established burns unit at Enugu State Hospital. Yasir Iqbal specialises in cleft and craniofacial surgery in Pakistan. He is carrying out his BFIRST fellowship in Belfast, Dublin and Newcastle to enhance his understanding of complex facial reconstructions and the decisions taken in treatment approaches. Consultant Plastic Surgeon in Belfast, Chris Hill describes Yasir as ‘a highly motivated surgeon’ with ‘a high degree of technical skills and excellent communication skills’. He hopes that Yasir will gain a huge amount from the support he receives while working in the UK. There is a high demand for the specialties of cleft and craniofacial surgery in Pakistan due to a higher incidence of such cases in this region. Yasir believes that the experience he will gain through the BFIRST fellowship will result in advancement within the field of Craniofacial cleft reconstruction upon his return. Once established, he hopes to create his own fellowship in this specialty to increase the number of cleft surgeons in Pakistan, which is currently severely under-served. 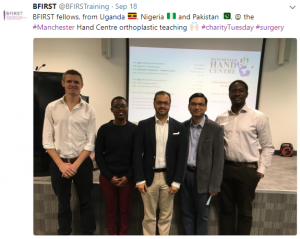 In September, all 3 fellows were fortunate enough to attend the Manchester hand surgery training course, thanks to the huge generosity of course convenor, Hand Surgeon Zaf Naqui. We wish the fellows all the best and hope to see everyone at the BFIRST update at the BAPRAS Winter meeting in November for further updates!